We are the perfect solution to free your family of head lice. We not only have the solution, but it is quick, safe, and easy! Even more, with the Signature AirAllé® full-service lice treatment, we are so confident it will work, we will re-treat you for free if your treatment fails *conditions may apply We also have over the counter lice treatment options! Our clinicians will carefully inspect the hair and scalp. If we confirm an active infestation and treat you, we will waive the screening fee. 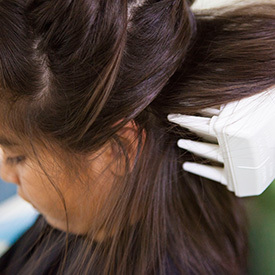 Because lice spread quickly through a household, it is very important that all family members are checked once an active case has been confirmed. This is our most popular and effective lice treatment option. It is a 3-step process which includes a 30-minute AirAllé® treatment, a 30- to 60-minute comb-out to remove the dead lice and eggs and an application of liquid gel on the head. This 3-step full-service treatment option ensures you will leave lice-free with no follow-up needed. With a success rate of over 99%, we are so confident you will leave lice-free, we offer a 30-day service re-treatment policy* as long as all family members have been checked for head lice in our clinic and treated as necessary. We do not recommend the AirAllé® treatment for children under four or for clients for whom the AirAllé® is contraindicated. In these cases, we recommend a strand-by-strand traditional comb-out to remove lice and eggs using only non-toxic products. 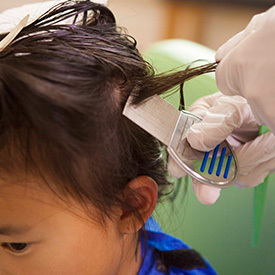 This over the counter lice treatment option requires the following: Purchase of an at-home comb-out kit, 30 minutes of combing every day for 10 days, a topical application day 5 and day 10, and an in-clinic recheck on day 11. We do not offer our re-treatment policy for this service. We provide all the topical treatment products you will need in this over the counter lice treatment, a professional lice comb, and detailed instructions on how to properly perform the comb-out. 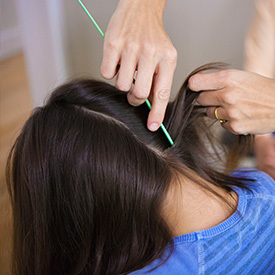 Since most parents are not experienced at lice-removal, to ensure all the lice are removed will take substantially more time than a professional treatment. The parent will need to perform several follow-up procedures during the next 11 days. Call today with any questions about our over the counter lice treatments.